The Penn–Calvert boundary dispute (also known as Penn vs. Baltimore) was a long-running legal conflict between William Penn and his heirs on one side, and Charles Calvert, 3rd Baron Baltimore and his heirs on the other side. The overlapping nature of their charters of land in Colonial America required numerous attempts at mediation, surveying, and intervention by the king and courts of England to ultimately be resolved. Subsequent questions over these charters have also been adjudicated by American arbitrators and the Supreme Court of the United States. The boundary dispute shaped the eventual borders of five U.S. states: Pennsylvania, Maryland, Delaware, New Jersey, and West Virginia. Charles Calvert, the 3rd Lord Baltimore, died in 1715, and William Penn died in 1718. Benedict Calvert, 4th Baron Baltimore died just two months after his father, so the boundary dispute was carried forth by Charles Calvert, 5th Baron Baltimore on Maryland's side, and by Penn's children John, Thomas, and Richard on the Pennsylvania side. The cupola of the New Castle Court House was used as the center of the Twelve Mile Circle. The boundary Commissions met here numerous times over the years. ^ New Netherland: a Dutch colony in seventeenth-century America by Jaap Jacobs, p. 115. Books.google.com. Retrieved 2015-03-20. ^ "History". Delawareliving.com. Retrieved 2015-03-20. ^ "Swanendael Settlement". Delaware Division of Historical and Cultural Affairs. Retrieved 2015-03-20. The division maintains a monument at the site of the original colony as well as a museum dedicated to interpreting its history. ^ "The Charter of Maryland: 1632". Yale Law School's Avalon Project. Retrieved 2015-03-20. ^ a b c d e f g h i j k l m n o p Nathan, Roger E. East of the Mason-Dixon Line: A History of the Delaware Boundaries. Delaware Public Archives. p. 68. Retrieved 2015-03-20. ^ "Fort Christina". National Historic Landmark summary listing. National Park Service. Archived from the original on 2007-12-06. Retrieved 2015-03-20. ^ a b Richard Greenwood (July 21, 1975). "National Register of Historic Places Inventory-Nomination: Fort Christina". National Park Service. ^ "The Charter of Pennsylvania: 1681". Yale Law School's Avalon Project. Retrieved 2015-03-20. This charter included the first documentary mention of the carve-out of a twelve mile circle around the town of New Castle. ^ a b Soderlund, Jean R. William Penn and the Founding of Pennsylvania: A Documentary History. University of Pennsylvania Press. Retrieved 2015-03-20. ^ Ohio. Message and Reports Made to the General Assembly and Governor of the State of Ohio for the Year: 1856, Part 1. books.google.com. Retrieved 2015-03-20. ^ a b Scharf, John Thomas. History of Delaware : 1609-1888: General history. books.google.com. Retrieved 2015-03-20. ^ Tom (2014-03-04). 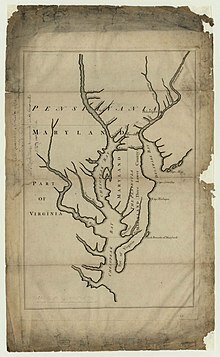 "Lord Baltimore's Map of Maryland in 1732". Ghosts of Baltimore. Retrieved 2019-02-24. ^ a b c "Lord Baltimore's Own Plan - Huntingfield Map Collection". Maryland State Archives. Retrieved 2015-03-20. ^ a b c Court of Chancery. The Breviate in the Boundary Dispute Between Pennsylvania and Maryland. books.google.com. Retrieved 2015-03-20. ^ a b c "Chew Family Chronology" (PDF). Cliveden.org. Retrieved 2015-03-20. ^ West Publishing Company. "The Federal Cases: Comprising Cases Argued and Determined in the Circuit and District Courts of the United States from the Earliest Times to the Beginning of the Federal Reporter, Arranged Alphabetically by the Titles of the Cases and Numbered Consecutively, Book 30". Retrieved 2015-02-28. ^ "State of New Jersey v. State of Delaware, 291 US 361". FindLaw. Retrieved 2017-06-23. ^ a b Mitchell, Charles. Landmark Cases in Equity. books.google.com. Retrieved 2015-04-02. ^ "FindLaw | Cases and Codes | State of Rhode Island v. Commonwealth of Massachusetts, 37 U.S. 657". laws.findlaw.com. Retrieved 2015-04-02. ^ "FindLaw | Cases and Codes | Commonwealth of Virginia v. State of Tennessee, 148 US 503". laws.findlaw.com. Retrieved 2015-04-02. ^ "FindLaw | Cases and Codes | State of Virginia v. State of West Virginia, 78 US 39". laws.findlaw.com. Retrieved 2015-04-02. ^ "FindLaw | Cases and Codes | State of Missouri v. State of Illinois, 180 US 208". laws.findlaw.com. Retrieved 2015-04-02. ^ "FindLaw | Cases and Codes | State of Maryland v. State of West Virginia, 217 US 1". laws.findlaw.com. Retrieved 2015-04-02. ^ Scott, James Brown. Judicial Settlement of Controversies Between States of the American Union. Books.google.com. Retrieved 2015-04-02. ^ "FindLaw | Cases and Codes | Hans v. Louisiana, 134 U.S. 1". laws.findlaw.com. Retrieved 2015-04-02. ^ Dixon, Martin. Modern Studies in Property Law, Volume 5. books.google.com. Retrieved 2015-04-02. ^ "FindLaw | Cases and Codes | Pennoyer v. Neff, 95 U.S. 714". laws.findlaw.com. Retrieved 2015-04-02.